We think these quick and easy cherry cookies that are loaded with chocolate chips would make a great treat for your sweetheart! While you may not be fond of using boxed mixes, you will love the convenience and cake batter taste of these cookies. Oh my, this cake is so refreshing and delicious! Celebrate Summer’s arrival with fresh strawberry cake topped with strawberry cream cheese frosting. Pureed fresh berries and strawberry extract combine for a lively flavor that is not in the least artificial. Quick, easy, delicious and made from just a few simple ingredients, this strawberry cake recipe is a keeper! Made with our NEW versatile Pure Strawberry Extract. Yum! 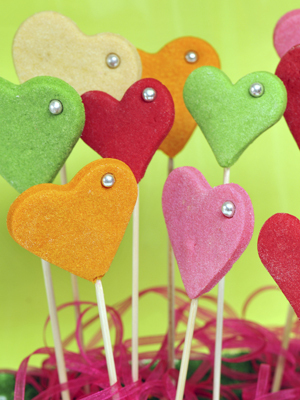 Make heart cookie pops extra special with colored cookie dough! You can wrap them for Valentine’s Day gifts, just slip a cellophane bag over the cookie and tie with a ribbon! 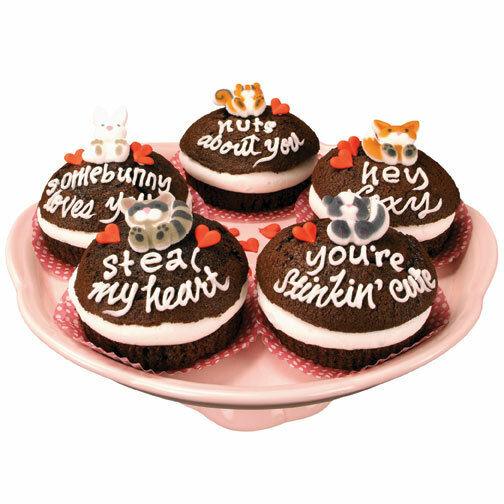 *DECORATING IDEA – Pipe cute and sassy Valentine sayings on the baked cookies to turn them into fun conversation hearts! 1. In a medium-size bowl, mix the flour and salt. In a large bowl, cream the butter and sugar, stir in the egg, then the corn syrup and vanilla extract. One third at a time, add the flour mixture until thoroughly mixed. 2. Divide the dough into portions and use a toothpick to add food coloring to each one. Knead until the color is evenly distributed. For a flavor surprise, omit the vanilla extract and add 1 teaspoon of lemon extract to the yellow dough, mint extract to the green dough, and strawberry extract to the red dough. 3. Pat the dough into two disks, wrap in plastic, and refrigerate for 1 to 2 hours, or until firm enough to roll. If it is too firm, soften at room temperature for 5 minutes. 4. Preheat the oven to 375 degrees. Roll one disk of dough between two pieces of parchment paper to 1/4 inch thick. Remove the top sheet and cut out the cookies with heart shaped cookie cutters. 5. Using a metal spatula, transfer the shapes to baking sheets, about 1 inch apart. Lift up the pointy edge of each heart shape and gently place a cookie stick underneath. Press on top of the cookie slightly to ensure the stick is in place. 7. Bake for 8 to 10 minutes or until cookies start to brown lightly around the edges. Remove the baking sheet to a wire rack and cool for 5 minutes.